NEWS TIP FOR TUNISIA WE NEED YOUR HELP DUE TO GOVERNMENT, PRESS AND MEDIA SILENCE ABOUT THIS LIE AND CONSPIRACY. Chokri Belaid Assassination is a Tunisian Government and Political Conspiracy and a lie from A to Z.
I am writing you these words to let you know about the fake story about the Assassination of Chokri Belaid in Tunisia the 6th of February 2013. I would like to inform you that this assassination never happened and Chorki Belaid left the country on the night of the 5th, Feb 2013 and the following day the family and some government officials in Tunisia and the Media did the scene of the Ambulance that left the scene without a dead body to the Hospital of Ennasr. Since I am familiar with the region of that hospital its far from the house of Belaid and there are no people to witness the arrival of the Ambulance without a dead body. (the dead body belongs to an other innocent person waiting at the fridge of that hospital from the night before). Then they headed out with that different dead body other than Chokri Belaid who was not killed with more than 70 Kgs of ice to a different hospital named Charles Nicole. The reason for using that huge quantity of Ice is to preserve that body when taking it from the freezer as i said above. Then on the 8th of February 2013 they buried that body when no one was able to see it and when there are no pictures or videos and since then thill this second the Army is guarding the grave 24/7, because they are scared that anyone opens the grave and finds out that Conspiracy. I urge you and the international community and the international Human Rights Organizations to open an urgent independent investigation in that case and force the Tunisian Government to allow that investigating team to open the grave and take a DNA test from the body inside that grave belonging to Kamel GADHGHADI and also have access to the assassination file at the Tunisian Judges where there are no pictures of Chokri Belaid before and after the authopsy, cause there was no authopsy of Chokri Belaid since he was not Killed. There is only an a scanner of a dead body belonging to Kamel Gadhgadhi the presumed killer, but in fact he was the person being killed and buried in that grave. The scanner picture shows only skeleton and the metal bullets. You can find a lot of videos in my youtube page explaining unfortunately in Arabic Language how each witness said different facts and the media interfered a lot in that conspiracy. Kais, we will look into it as this would not be the first time something like this has ever happened. The question is, is there any definitive proof that he is alive? Matthew Cohen, 75% of the Tunisian population are asking questions now. Why the family of Belaid are refusing to publish the body pictures before and after the autopsy. There is a huge story hiding behind this never happened assassination, I personally had the chance to speak to different witnesses including family members and friends of Belaid and each one was telling a different story of the bullets hits. I am 10000000000000% sure now that it’s a political and government conspiracy where even the Portrait Robot that the police issued before was a photo-shop made from the real picture of Kamal Gadhgadhi who they killed and buried instead of Belaid. Matthew Cohen, 75% of the Tunisian population are asking questions now. 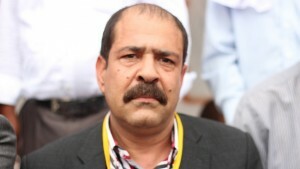 Why the family of Belaid are refusing to publish the body pictures before and after the autopsy. There is a huge story hiding behind this never happened assassination, I personally had the chance to speak to different witnesses including family members and friends of Belaid and each one was telling a different story of the bullets hits. I am 10000000000000% sure now that it's a political and government conspiracy where even the Portrait Robot that the police issued before was a photo-shop made from the real picture of Kamal Gadhgadhi who they killed and buried instead of Belaid. Very dangerous: The Tunisian Ministry of Interior, the number on suspect of the political conspiracy in the lie of the assassination of Chokri Belaid that never happened uses Photoshop to create a fake Portrait robot, of Kamal Gadhghadi killed and buried instead of Chokri Belaid who left the country with a different Identity and Passport the night before the assassination lie, from his ID photo held in the ministry files. Instead of creating a Portrait Robot from witnesses, they created it from faking and copying/pasting parts of the face as they appeared exactly on his ID picture given to issue his personal ID. As we all known the photo of a portrait robot is made by a special department at the Ministry of Interior relying on witnesses to shape the image of the accused, but in this political and government conspiracy lie of the assassination of Chokri Belaid there are no witnesses because the last was never killed. The accused supposed killer Kamal Gadhghadi was murdered and buried in this case. The ministry of Interior participated in this crime drama and faked a lie assassination of Chokri Belaid then used Photoshop or a similar software to create a fake Portrait robot from the original photo of Kamal Gadhghadi and they fabricated a camouflage portrait robot to Kamal Gadhghadi and published it through the Tunisian media prior to the publishing of the real picture. All the above and other facts confirm once again that the assassination Chokri Belaid was a lie from A to Z and it is a political and Government conspiracy involving several parts.